Camille Villa is perfect for the couple or friends who want to get away but also want to enjoy the life the island has to offer. 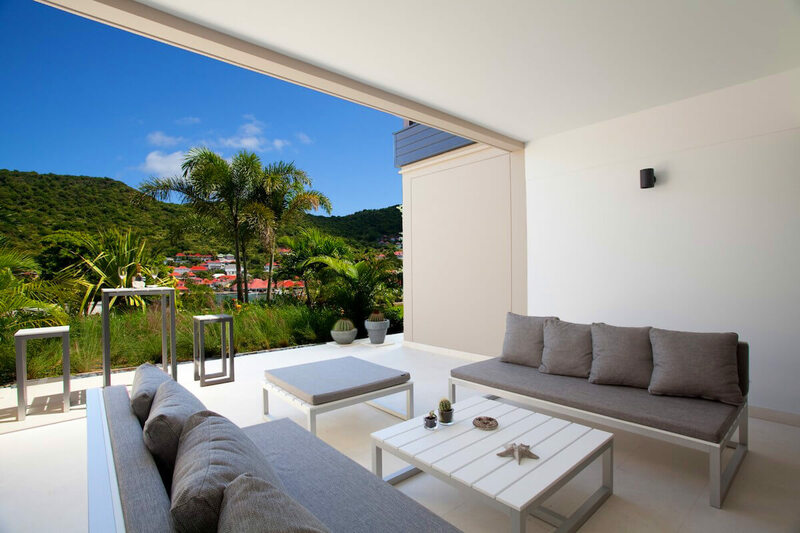 Camille Villa has the perfect location near Gustavia for walking to restaurants, shopping, Shell Beach and more! Shell Beach has great snorkeling, sunsets, and a beachfront restaurant that I love, and I know you will too. Great view of the harbour! Camille Villa is located just outside the heart of Gustavia in a luxury apartment complex with private parking and elevator. This apartment has a view of the harbor and yachts, the perfect property for a romantic getaway and world-class business trip. This chic villa has an open floor plan that blends with the private terrace. The terrace has plush lounge furniture and a dining nook, and looks out over the harbor and Gustavia. The living area is bright and cozy, with wall-to-wall sliding glass doors, an entertainment system, and satellite TV. Kitchen appliances are tucked into the wall, so the space feels like a studio. The formal indoor dining area is tucked into a corner of the living room. The master bedroom is around the corner, with a spacious ensuite bathroom, queen-sized bed, air-conditioning, and French satellite TV. Camille Villa is located within walking distance to Shell Beach and a handful of restaurants and shops. The villa is handicap-accessible, with basement car parking and a lift. Walking distance to Shell Beach. Shawna is great. Very attentive and patient without being pushy. The booking procedure works well.